This article will briefly discuss each of these and what role they play in the reef aquarium. The most important type of filtration in any aquarium is biological filtration. Put simply, this wonderful process converts the waste products of the reef inhabitants to a non-toxic state. This complex yet crucial process is carried out by various types of bacteria that live on every surface of your aquarium. In order to maximize the growth potential of the bacteria, aquarists utilize biological filters. There are many types of biological filters on the market. Under gravel filters, bio-wheels, wet/dry or trickle filters all have the same goal, to house and grow nitrifying bacteria. These types of filters are essential for fish only systems. Without sufficient surface area for the bacteria to grow, the carrying capacity (i.e. the amount of animals the aquarium can safely support) quickly becomes very low. The reason for this is the presence of toxic ammonia. In the aquarium, ammonia comes from two main sources. The first is the breakdown of organic material by heterotrophic bacteria. All of the excess food, fish waste, dead bacteria etc. is converted to its basic state of inorganic materials (including ammonia), CO2 and water. This process is called mineralization. The second source (and a very important one) is the bi-product of animal respiration. Aquatic animals release ammonia directly into the aquarium water. This is a passive process. If the levels of ammonia in the surrounding water become too high, the animals cannot get rid of their own waste ammonia. This normally happens when an aquarium is has just been set up and the bacterial population has not become established or something has caused an existing population to die back. This is the number one killer of aquarium inhabitants. Luckily for us the ammonia produced by these sources is converted to nitrite (NO2) by a group of autotrophic (self feeding) bacteria. Nitrite, though nowhere near as dangerous as ammonia, is thankfully metabolized by another group of bacteria that convert it to the relatively benign nitrate ion (NO3). This process is called nitrification. In many fish only systems this cycle ends there, and water changes or some sort of denitrification filter reduces the ever-accumulating nitrates. These filters utilize various species of bacteria that can live with or without oxygen. When these bacteria are kept at very low oxygen concentrations, they utilize the oxygen in nitrate and convert it to nitrogen gas (N2). This process is called denitrification. Conveniently, when we fill our aquariums with live rock and sand, we get a perfect home for lots of bacteria, both nitrifying and denitrifying. 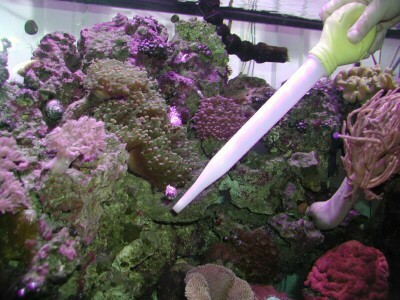 All of the surfaces in your reef effectively become your biological filter. The oxygenated surfaces, such as the outer surfaces of rock and top layer of sand, support the nitrifying bacteria. The innermost layers of rock and lower levels of sand can support the denitrifying bacteria. Therefore, there is no need for additional bio-filtration (bio-balls, wheels, etc.) 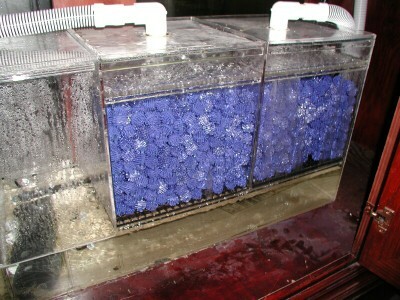 The establishment of the biological filter takes place the moment you place live rock and live sand into the aquarium. The length of time that the reef’s biological filter takes to establish will vary from tank to tank. If the live rock or sand has just come from the ocean, then it is referred to as uncured. There are many organisms on the rock (sponges, tunicates, crabs, etc.) that will die off as a result of shipping. 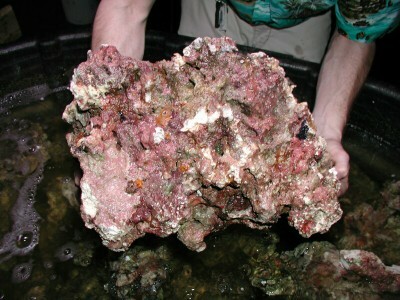 Therefore the rock needs to be placed into a vat or fishless aquarium to “cure.” Through the use of filtration and water changes, the die off ends and all of the forms of life, including bacteria, start to grow. In general, the bacterial colonies in an established reef tank are quite resilient. However, just like with a fish only aquarium, there are certain things that must be avoided to ensure their stability and to avoid an ammonia spike. Avoid introducing large amounts of organic matter in a short period of time, i.e. uncured rock. Do not add any sort of antibiotics directly to the reef. Unfortunately, the medications that you would use to treat infected fish cannot distinguish between the pathogenic bacteria and the nitrifying bacteria. Therefore, always treat infected fish in a separate hospital tank. Also it is important to resist the urge to treat cyanobacterial blooms with these medications as well. It is true that these “slime algaes” will respond to treatment with antibiotics such as erythromycin. However, you could easily do more harm than good if you end up killing off your beneficial bacterial population in the process. This hang on power filter utilizes rotating biological contactors (aka bio- wheels). Although this type of filtration works well for fish only aquariums, it is redundant on a reef aquarium. Although wet/dry filters do an excellent job of housing the bacteria that convert ammonia to nitrate, the process ends there. It is important to remember when adding live rock to an aquarium that, unless the rock has been cured, there can be substantial die off. Scavengers are an integral part of the reef aquarium, but use caution, some species such as this hermit crab ( Dardanus megistos ), can grow up to 5” and be predatory toward small fish, and will definitely eat corals. 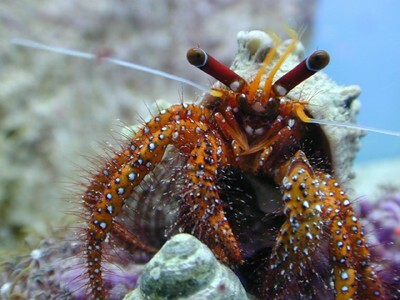 However, there are many smaller hermit crabs that are well suited to a reef tank and are excellent scavengers ( Paguristes cadenati, Clibanarius digueti and C. tricolor, Calcinus laevimanus ). Another means of biological filtration that does not involve bacteria is the use of algae to metabolize nitrogenous compounds. This includes, not only the symbiotic algae that grow in corals, but micro and macro species as well. Many reef aquarists are incorporating a small area in their systems to grow various algal species. These areas, often referred to as algae scrubbers, are located in a separate tank that is in some way connected to the main system. The algae are grown in a protected area for two reasons. First, many beneficial herbivorous species, such as Tangs or Angelfish will usually wipe out any cuttings that are initially introduced. Second, many aquarists have found that these types of algae, once established, grow very rapidly, eventually overtaking the slower growing corals. With the use of these scrubbers, aquarists can easily harvest the excess algae for use as fish food or to simply export nutrients from the aquarium. An added bonus to this sort of system is theability to protect and “farm” various invertebrate species that, like the algae, would normally be consumed by the various fish in the main reef. When live sand (and/or live rock) is placed in these protected areas, they become a refugium for all sorts of livestock that could not be maintained in the main reef tank. The next type of filtration is mechanical filtration. This is the process in which undissolved particles are removed from the water column. This helps to maintain the water clarity and allows for the removal of organic matter from the aquarium before it has a chance to break down. In fish only systems, this type of filtration can be very important by protecting various pumps and preventing the fouling of the biological filter. Mechanical filters can take many forms, from the simple floss pad inserts in a typical powerfilter to enormous rapid sand filters at Sea World. They all have the same purpose, to catch stuff that is floating around in the tank. Today more and more aquarists are finding that mechanical filters are unnecessary in the reef aquarium. This is mainly due to the fact that the surfaces in the aquarium where detritus settles is constantly being picked over by an enormous clean-up crew consisting of fish, crabs, shrimps, snails, polychaete worms, etc. all the way down to the bacteria. In fact, some aquarists believe that the absence of a mechanical filter is preferable because the free-floating debris helps to feed various filter feeding organisms. There are times, however, when filter pads can be helpful. For instance, a filter pad or sponge may help remove tiny air bubbles that accumulate in the aquarium from the discharge of a protein skimmer or to help quiet the splash of water into a sump. So, if you do choose to use some sort of mechanical filter in your reef, there are a few things to keep in mind. It is important to make sure the filter is easy to access and clean. In my experience, the more difficult something is to keep clean, the less likely you are to keep up with it. 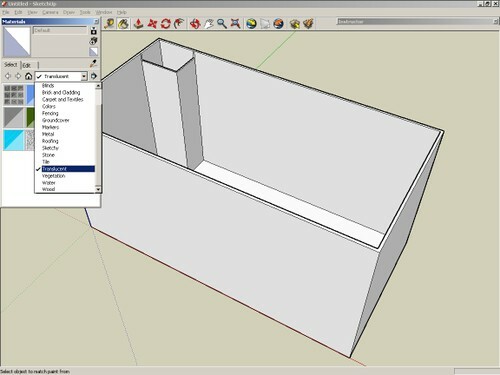 Try to buy or build a filter that will allow you to use a “cut your own” type of filter pad. It can be costly to continually replace the pads, and frequent rinsing will pull the fibers of the pads apart and greatly reduce their effectiveness. Sponges can be used for some applications, but be warned, they can hold a LOT of debris so you will spend longer rinsing them out. Try to clean or replace the filters frequently to prevent the buildup of materials that can act as a sink for nutrients. These nutrient build-ups can contribute to various algae problems. An unexpected bonus that can arise from using some sort of prefilter sponge or pad in a reef is that often the filter becomes a breeding ground for various beneficial organisms such as copepods, amphipods, bristle worms etc. So, before you wash or toss that old filter pad out, look it over for anything that you can toss back into your tank as fish food. If you choose not to use any sort of mechanical filtration on your reef, there are a few things that you can do to prevent the same nutrient build-ups from occurring. It is essential that you have an effective “clean up crew.” Many companies sell packages that include various snails, crabs, brittle stars etc. that you can add to your reef to keep all of the undisolved debris from accumulating. There are even companies that can sell you starter (or recharger) kits that contain tiny animals (polychaete worms, copepods etc.) that can help you maintain an active sand bed. Another method, usually used in conjunction with the animals, is to siphon off the live rock when you do water changes. This is especially helpful on newer set-ups. Then as the tank matures, and the number of scavengers increases, you can use a small powerhead (or even a turkey baster) to blow the debris out of any holes and crevasses. This sort of man-made storm can help to prevent nutrient buildup on the rocks and corals themselves. Another important type of filtration is chemical filtration. This is the non-biological removal of dissolved substances from the aquarium. Typically, most people think of this process as being accomplished by absorption, adsorption or ion exchange. There are however other methods such as foam fractioning (or protein skimming), ozonation and ultraviolet sterilization that should be added to this category as well. There are many methods of chemical filtration available to the marine reef aquarist, and although none of them is absolutely necessary for success, all of them can be very helpful in the export of unwanted organic material from your reef. All of the animals, algae, and bacteria in your aquarium release organic compounds as they go about their life processes. These compounds (proteins, carbohydrates, phenols etc.) are collectively referred to as dissolved organic compounds (DOC). Because these compounds are dissolved in the aquarium water, mechanical filtration alone cannot remove them. As these compounds accumulate in the aquarium, they cause the water to take on a yellowish tinge. Although there are tests for DOC, one easy way to check the level in your aquarium is to view the tank from end to end. If the water looks greenish/yellow then you may benefit from some sort of chemical filtration. Probably the most common method of chemical filtration is the use of activated carbon. “Activated” carbon, is bituminous coal that it has been subjected to very high temperatures and pressures which drives out all of the impurities. This process opens up billions of tiny pores that can either physically trap various organic molecules (absorption) or they can be held to the carbon by chemical bonds (adsorption). Many types of carbon are washed with phosphoric acid during their processing, and can leach phosphate back into the aquarium. Since excessive phosphates can encourage algal growth and retard or stop calcification by calcifying animals, it is important to use a carbon that is designed for aquariums and releases very little (if any) phosphates. When adding carbon to your system it is best to place it in an area of at least moderate flow. The use of mesh bags, and baskets is very commonly used for this purpose. Unfortunately, there are no hard and fast rules as to the amount of carbon that should be used. The amount of DOC, as well as the quality of the carbon you are using, will greatly affect how long it will last. In my experience, it is best to use carbon on an as needed basis. For many tanks, this means around 8oz (around 1 cup) per 50 gallons every month. Many aquarists will remove the carbon after one month for fear of having the material that have been bound up in the carbon re-released back into the aquarium. There are other products available that act like carbon, but are actually synthetic adsorbents. Some of these products have certain advantages over carbon in that they can target various substances, such as phosphate, and can be regenerated. In my opinion these types of products should only be used as “safety nets” and should not be used as the sole means of nutrient export. One word of caution, if your reef has become very yellow and you wish to use some form of chemical filtration to clear it up, you may want to do so over the course of several days. The rapid clearing of the water can expose your corals to light levels that they are not used to. One piece of equipment that many aquarists use as their main source of nutrient export is the protein skimmer (aka foam fractionator). Most people probably don’t think of a protein skimmer as chemical filter, but technically they are removing materials that are dissolved in the aquarium water. Generally speaking, the process of skimming is very straightforward. Air and saltwater are mixed in a column where substances such as proteins, fats, carbohydrates, phosphates and a variety of other things, form a foam that is then skimmed off and extracted from the system. One real advantage to this type of filter is that it removes these substances entirely from the system before they have a chance to breakdown. Editor’s Note: protein skimmers can also be seen as algae scrubbers. Much of the skimmate produced by them is composed of phytoplankton, microalgae which have utilized nutrients for their growth, and which are then removed from the aquarium by the skimmer. When selecting a skimmer, try to size it for your particular aquarium. You can follow the manufactures guidelines and/or ask fellow reef aquarists for their input. Try to find a skimmer that will be easy to disassemble for regular cleaning. Normally you will only be cleaning the collection cup, but the better skimmers come apart for complete servicing. Make sure that you purchase a skimmer that will fit with your system. Will it fit under your cabinet? Is it an internal or external model? By conferring with local fish stores and other hobbyists, you will be able to select a skimmer that is right for you. One very powerful form of chemical filtration is the use of Ozone. This naturally occurring gas has been used for years in commercial and industrial water treatment due to its powerful oxidative properties. The ozone molecule (O3) owes this power to the 3rd atom of oxygen that quickly reacts with organic (and inorganic) compounds. Most aquarists use ozone in conjunction with a protein skimmer or other type of reactor. The use of small amounts of ozone can help clarify the water and increase the efficiency of a protein skimmer. It is also used to control disease outbreaks, by “burning” the membranes of bacteria, protozoa, and viruses. Despite the wonderful potential of ozone, there are some drawbacks. If not incorporated into your system properly, or if left unmonitored, it can do real damage to your reef. The last type of filtration that I would like to mention is Ultraviolet Sterilization (U.V.). This method of filtration barely falls into the category of chemical filtration, however because they do produce ozone and are so common in the fish keeping industry, I feel I must mention it. A simple turkey baster can dislodge pockets of detritus. A small power head works well also, although it is important to use some sort of ground fault protector (such as a power strip). A good quality skimmer can help remove dissolved organics before they have a chance to be metabolized into nitrate. U.V. sterilizers are used by many aquarists to control the population of disease causing organisms. By passing part of the water from their system past an ultraviolet light, various bacteria, fungi, and parasites are “zapped” out of the system. The reason for this is that ultraviolet light, which produces wavelengths around 200-300nm, destroys the DNA of the microorganisms that pass through the chamber. This is a very safe method of disease control because only the organisms that pass through the sterilizer are affected. Remember, our good nitrifying bacteria grow on surfaces, and once established, would not be affected. In addition, the production of dangerous byproducts is not a concern the way it is with ozone. The efficacy of these units is dependent upon several factors, which include, but are not limited to: wattage of the bulb, contact time between the light and the water, temperature of the bulb and system water, and how much energy it takes to kill the target organism. I mention these issues only to give you some idea of the things you will need to keep in mind if you decide to purchase one of these units. There is some debate (like every other aspect of this hobby) over the usefulness of a U.V. 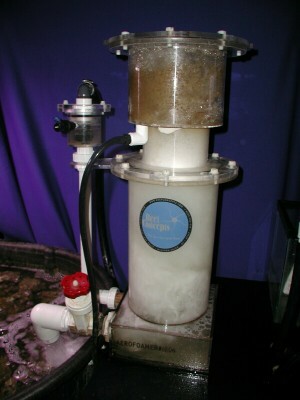 sterilizer on a reef tank. Some people feel that, if sized properly, these units can be very helpful in the prevention of disease outbreaks. This is a very attractive notion due to the fact that there are very few weapons we have to ward off diseases in an invertebrate aquarium. On the other hand, you have other aquarists that do not like the idea of indiscriminately destroying any of the microorganisms that float past that light. They feel that the preservation of any plankton that may exist in the reef out weights the need for disease control. Personally I believe the answer lies somewhere in between. Much like other types of mechanical and chemical filtration, I use U.V.s on an as needed basis. This article has merely discussed the surface of some very involved filtration methods and concepts. It is easy to become overwhelmed with all of the products and opinions that surround the reef hobby. By gaining an understanding of the basics of biological, mechanical and chemical filtration, you will be more able to select the type of filters that are right for you. It is important to keep in mind that new ideas and methods are always arising and I would encourage anyone who wishes to learn more about these important topics to check out various marine/reef-keeping texts such as The Marine Aquarium Reference by Martin A. Moe Jr. or The Reef Aquarium by J. Charles Delbeek and Julian Sprung or Dynamic Aquaria by Walter H. Adey and Karen Loveland. Taking advantage of these and other good books will continue to solidify your knowledge of filtration in the modern reef aquarium.